Anvil Semiconductors and the Cambridge Centre for GaN at the University of Cambridge have successfully grown cubic GaN on 3C-SiC on silicon wafers by MOCVD. The underlying 3C-SiC layers were produced by Anvil using its patented stress relief IP that enables growth of device quality silicon carbide on 100mm diameter silicon wafers. The process is readily migrated onto 150mm diameter wafers and potentially beyond without modification and is therefore suitable for large, industrial-scale applications. The MOCVD growth trials at Cambridge, conducted under a project funded by Innovate UK, have resulted in single phase, cubic GaN. The layers, characterised by XRD, TEM, photoluminescence and AFM, show promise for LED applications. The availability of cubic GaN has the potential to remove the strong internal electric fields which plague conventional green LEDs and which impair recombination and make it difficult to address high internal quantum efficiency (IQE). Additionally, cubic GaN has a narrower bandgap and improved p-type electrical properties compared to the standard hexagonal GaN phase normally used for LEDs and therefore offers several advantages. 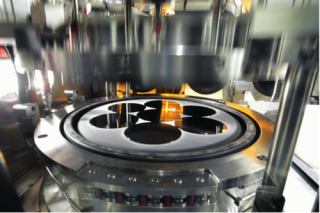 The ability to produce cubic GaN from a readily commercialisable process on large diameter silicon wafers is clearly recognised as a key enabler for increasing the efficiency and reducing the cost of LED lighting. The team intends to continue development to the point of fabricating sample LEDs before looking for an industry partner to help commercialise the technology. Jill Shaw, CEO of Anvil Semiconductors added: “This is a very exciting result which potentially opens up the LED market for our 3C-SiC on silicon material. We will certainly be looking for partners to help us take this opportunity forward”.